Free Photos of Lighthouses, Bell Buoys, and other Aids to Navigation. 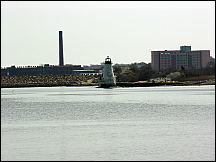 Pictures of lighthouses and other navigation aids such as the harbor buoys, lights, bell buoys, cans and light towers are available for downloading. There is also a section on recommended books. Aids to navigation have been around as long as sailors ventured upon the Oceans. Even today, as sophisticated electronic navigation systems seem to make visual methods somewhat obsolete, the older methods of providing visual reference points are still essential. While somewhat less important for giving notice of dangerous rocks and shoals, they still provide a sense of reassurance that the instruments are performing properly and that if a malfunction occurs, all will not be lost. Each light house or buoy has a distinctive pattern of lights, or sounds, or bell tones, or patterns, or numbers, that assist a navigator in determining his or her position. 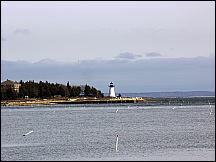 Neds Point Lighthouse, Mattapoisett, Mass. West Island Bell Buoy. Fairhaven, Mass. Quicks Hole Green Can, Vineyard Sound, Mass.